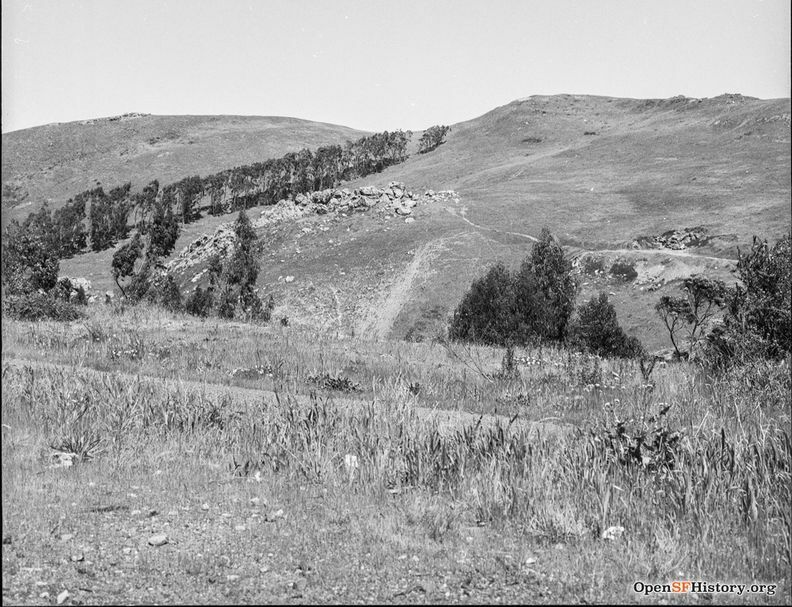 Diamond Heights before development, looking east across Glen Canyon to rock outcrops, April 1957. 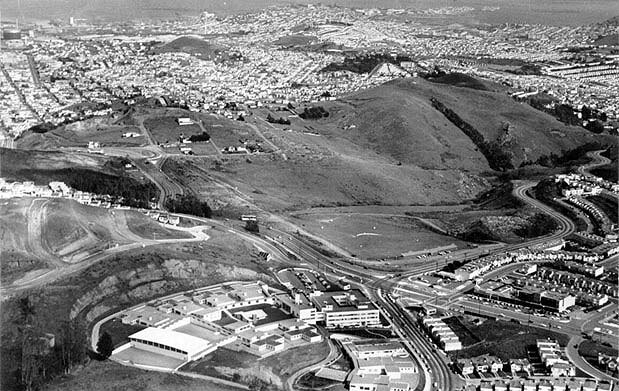 Aerial view of Diamond Heights, 1955. 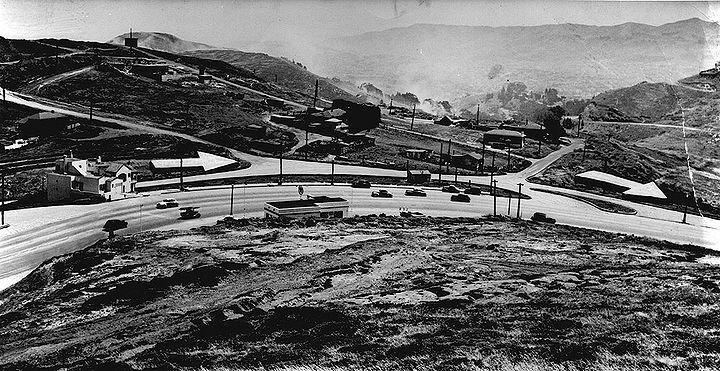 Diamond Heights under construction, arrow points to Clipper and Diamond Heights Blvd., c. 1960. The development of this last large area of Rancho San Miguel was unique. For that reason it warrants special comment. Using a combination of Federal, State, City and County funds, the San Francisco Redevelopment Agency reshaped this 300 acre site into a community known as Diamond Heights. Land was available for purchase at a fair value by private enterprise for residential, community and institutional development. The result was a self-contained neighborhood providing almost a total array of services and conveniences for everyday living within its boundaries--a city within a city. The range of housing choices provided opportunity for a mixed population, singles, families, young, elderly, low to median income with varied lifestyles. 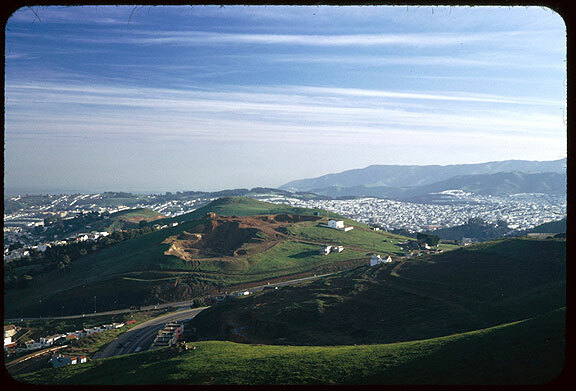 View southward of Diamond Heights from Twin Peaks, January 22, 1953. While Diamond Heights plan was different compared to previous developments of Rancho San Miguel land, the idea reflected the current trend in national housing. The funding mechanism for this project was unusual compared to those used historically. Massing Federal, State and City funds through a coordinating body called the Redevelopment Agency gave this funding formula a distinctive political character. While such an idea was perhaps current, its political nature provoked controversy and dissension from beginning to end. For that reason, it was unwieldy to administer. 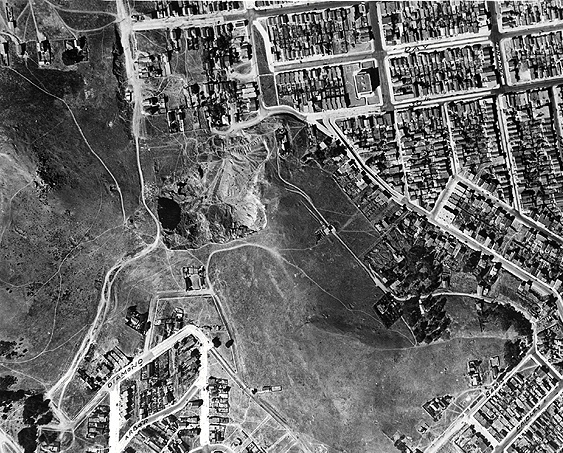 On July 14, 1955, the Redevelopment Agency of the city and county of San Francisco described Diamond Heights this way: "[it] is presently a predominantly open, blighted area, characterized by the following conditions: economic disuse; faulty planning; the subdividing and sale of lots of irregular form and shape and inadequate size for proper usefulness and development; the laying out of lots in disregard to the contours and other physical characteristics of the ground and surrounding conditions; the existence of inadequate streets, open spaces and utilities; economic maladjustment to such an extent that the capacity to pay taxes is reduced and tax receipts are inadequate for the cost of public services rendered; and lack of proper utilization of area, resulting in a stagnant and unproductive condition of land potentially useful and valuable." Members of the Diamond Heights Neighborhood Association were stunned. They were unaware they were living in a slum. They countered with a lawsuit contesting anyone's right, including the government's, to take their land. The California State Supreme Court upheld the Redevelopment Agency's position on November 23, 1954 and on December 6, the United States Supreme Court refused to hear the case. There were 169 improved real properties in the project area. Forty-nine were excluded from the plan and 80 were required to make property changes to comply with Redevelopment Agency's regulations. In 1961 various lands of Diamond Heights were deeded to San Francisco. The Board of Supervisors approved the deeded map of unit one and the following year adopted unit two. Until the project was completed in 1978, the Redevelopment Agency and its various counterparts ran into a maze of detours, road blocks and disasters. The project ran out of money, developers lost funding, the Grand Jury investigated, the Government Accounting Office investigated, principals resigned and reneged, and political feuds fueled this development into nightmarish proportion. 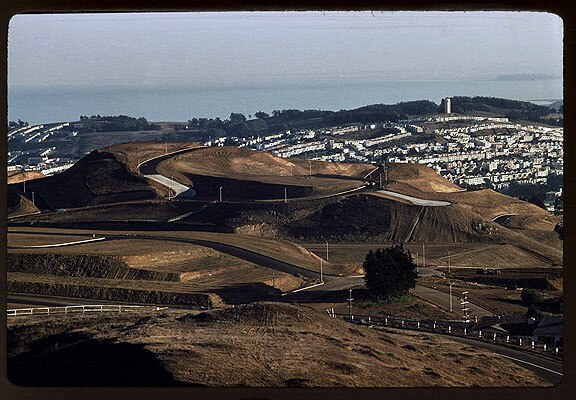 This photo taken on November 5, 1961 shows Diamond Heights after bulldozing had readied it for the planned housing. This city within a city was distinctive in its conception. Apartments, townhouses, houses offset by open spaces for recreation were coupled with churches, schools, stores, businesses, and public transit.